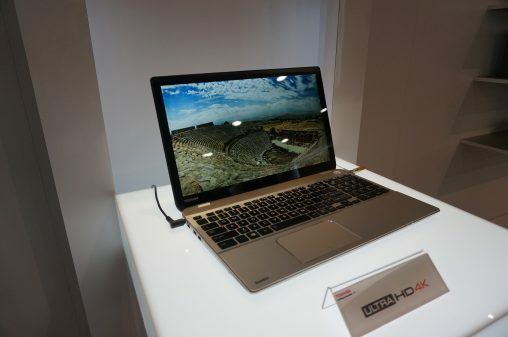 Toshiba’s stand at the 2014 International CES this week invites visitors to experience creative products from the Japanese brand, including new flat panel TV, a 4K notebook and a super-widescreen ‘5K’ display. In the TV space, Toshiba was going one better than most of its competitors (quite literally) with a 5K widescreen display that ups the resolution on traditional 4K to 5,120 x 2,160 (4K, or Ultra HD, is 3,820 x 2,160), whilst also boasting a widescreen with a 21:9 aspect ratio. If you prefer to stick with 4K — a technology that currently has some content available for viewing — the brand was also showing off an Ultra HD 4K notebook PC, which it bills as the world’s highest resolution laptop. Designed for more commercial applications, there was Toshiba’s Pillar Signage. This series of mirrored pillars displays individual “see-through” images, which all combined together to make a whole. While this wouldn’t make its way into most standard homes, it has great potential in the B2B space, especially for advertising. In the same vein was a mirror display screen, set up in a mock-bathroom display, which showed welcome messages and ran a series of stats that would have utilitarian value for a user first thing in the morning. It can provide information such as weather, the day’s schedule and calories burnt through exercise on the previous day. Beside this was a prototype “Smart Bracelet” designed to integrate with the display. 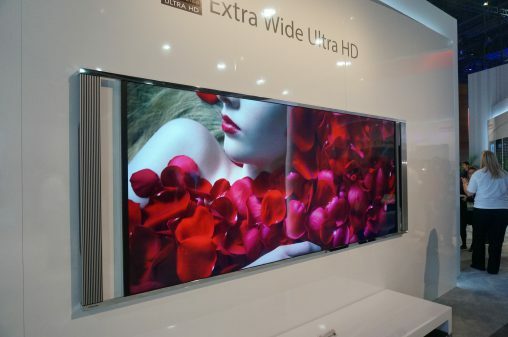 Toshiba’s Extra Wide Ultra HD 5K TV. The “world’s highest resolution laptop” this Ultra HD 4K notebook features a 3840 x 2160 display that promises more natural colours. 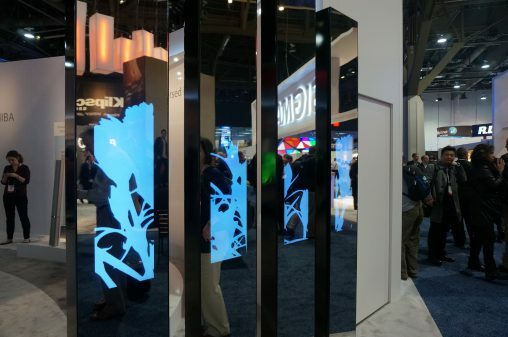 These mirrored pillars feature images that “appear to be floating in the air” according to their product description, thanks to an LED display inside. 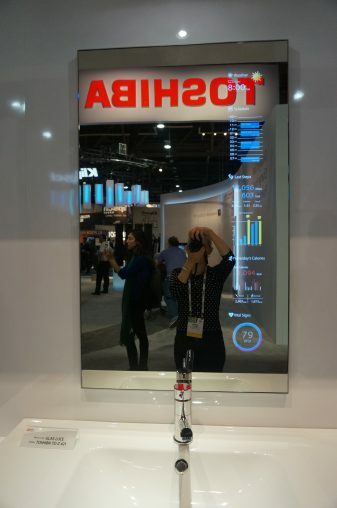 Wake up in the morning to all your vital stats, displayed on this Toshiba prototype bathroom mirror.